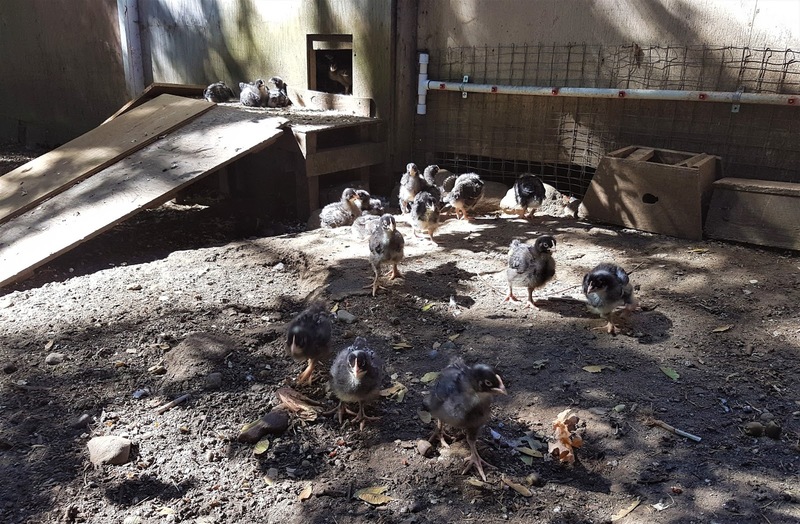 :Teresa.and.Marcus: : Feeding Mistral Gris chicks - 2.5 weeks old. Feeding Mistral Gris chicks - 2.5 weeks old. Two and a half weeks ago we acquired our second group of Mistral Gris broiler chicks from True North Heritage Hatchery. Technically this is our first batch of chicks as last year we got fertile eggs from True North and incubated them in our IncuView. While that was a lot of fun and we had great hatch rates, we were so impressed with their flavour and ease of processing the MGs that we wanted to raise a much bigger batch this year. We finished with 13 last year and after giving some to family and some farm gate sales to friends, we only had enough for a few months with rationing and restraint. Our 'bator only holds 24 eggs and we wanted more birds than that this time 'round so we decided to get chicks shipped. We decided on 50 as a good number. We have the infrastructure for about that many, and family to help out when it comes time for slaughter and processing. We are coming up on a significant time (for us) in the chicks' growth. Last year, right around 3 weeks of age, 2 of the biggest and seemingly healthiest birds died suddenly within a 24 hour period. I did a mini necrospy on them and found nothing obvious wrong. I vaguely remembered some of my poultry class teachings in vet school and with a little research came to the conclusion that they probably died of what is known as Sudden Death Syndrome of Broilers aka Flipover disease aka a couple other very descriptive names which match the syndrome. Here is a link from Merck but basically the birds grow so fast that their bodies outgrow the ability of the heart to keep up and they die of cardiac arrhythmias. Our Mistrals ate themselves to death. Although Mistral Gris are bred to grow more slowly so they are at far less risk for sudden death than the typical Franken-chicken broiler you find in your grocery store, we learned the hard way that this can still happen if you let them eat all they want. I contacted Emily at True North who was extremely helpful. She helped me change their feeding plan and also sent me a growth chart so I could compare our birds to what they should be. 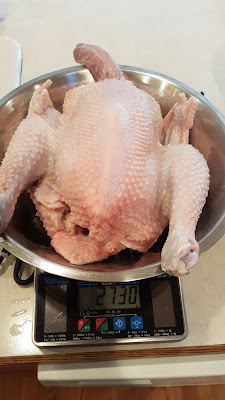 I weighed our chicks and found that they were horrendously overweight, averaging 1.5 times the weight they should be at that age. We dropped the percentage of protein they were on (from 18% to 16% and then 15%) and also started restricting the time they had access to food. We took it up at night and gave them access to it for 2 hours, 3 times a day, and then twice a day as they got older. After this we didn't have any more sudden deaths but since this seems to happen about the 3-4 week mark and not generally later, this may have been more coincidence rather than anything we changed at that point. Despite limit feeding they still stayed ahead of the growth curve; I couldn't slow them down enough to get them back on track. The birds dressed out large but they did not have quite as nice body composition as I've seen other people get with Mistrals. Ours had less breast meat and were longer legged. I wonder if this was because of their abnormal growth in the first few weeks and then too much protein restriction in later weeks. Despite this, compared to Sassos that we raised the year before, the MGs were so much easier to process and dress, and so delicious and tender on the plate, that we knew we had to try another batch and see if we could correct our mistakes. I spoke with another Emilie (find her at Combs and Hackles on Facebook) who also raised Mistrals and hadn't had any sudden death issues. She did not baby hers at all (took the heat lamp away at a week of age) and although she didn't limit feed them or drop their protein percent drastically, she let the feeder go empty and stay empty for a while before filling it up again. Her birds looked amazing dressed out, much meatier than ours, and were heavier at the same age. So... given all this, what have we done so far? We moved the chicks into their coop almost immediately rather than having them in our warm basement for their first couple of weeks. No coddling! We wanted to take their heat lamp away after a week but we had to go away and our chicken sitter wasn't comfortable with that. We took it away at 2 weeks instead. This is mid summer so Im not sure they even needed it at all. I did a bunch of research into what caloric and nutrient requirements are for broilers and we are feeding them a set amount per day broken down into multiple feedings. We are letting them go several hours with the feeders empty before giving them their next portion. We're not going to protein restrict them as drastically as last year. We are encouraging them to go outside and exercise much earlier than the last batch and they have had access to outside sooner than the last group. We wanted them out even sooner but again, since we were away, the sitter wasn't comfortable with that. We will weigh 10 of them weekly to see where they compare to True North's growth chart and will adjust amounts fed based on how they compare. We have many feeders to allow all of them opportunity to eat immediately. If we have the room at the time we may separate the males and females at 6 weeks to reduce competition at the feeders. They have been on 20% starter since day 1. We weighed them at 2 weeks but True North's chart starts at 3 weeks so Im not exactly sure how we are doing. However; they are well under what they should be at 3 weeks so we are happy about that! Their 2 week weight average is 213g. They are much more active than the last group. They are out in their yard much of the day foraging, zooming and flapping, sparring and dustbathing. We're ignoring their desperate cries that "we starving to death" and "we need more food", and sticking with the plan. Stay tuned, we'll continue to let you know how they do on the restricted feeding plan. Crossing fingers we've got more right than wrong this time around! Anyone else raising slower growing broilers? Any issues? How do you feed them?